never recognizing our own reflection on the pages. WHEREFORE, my beloved brethren, let every man be swift to hear, slow to speak, slow to wrath: 20For the wrath of man worketh not the righteousness of God. 21Wherefore lay apart all filthiness and superfluity of naughtiness, and receive with meekness the engrafted word, which is able to save your souls. We can listen and talk about God. Unless we do more than talk, our religion is merely pretentious. (1:19-21) Since we are begotten by God through the very word of God, we should, above all, be certain to listen to that word, and certainly, be cautious about what we say and even more so about any anger we might have.The reason we listen to the word of God is not merely to talk about it, or to use that word as a weapon in anger against others. Indeed, our anger, even about holy matters, cannot reflect what God wants of us or of others. That is why in listening to the word of God, we must, first of all, put aside unkindness and all evil displays and inclinations. We must listen with a sense of humility, knowing that the word which is implanted within us is there for the purpose of saving our very soul. (1:22-25) However, if all we do is merely listen to the word, we delude ourselves. Such a listener would be much like a man looking at himself in a mirror, but ignoring what he sees. We must not merely glance at the perfect law of liberty, we must look intently at the reflection we see. Otherwise, we listen, but soon forget and fail to practice what we have heard. The man who both hears and does, then, is the man who is blessed by what he does. (1:26-27) Should any of us regard ourself as religious, but fail to control our words, we deceive ourselves into thinking that we are religious. Indeed, such a religion is in vain. To be acceptable to God, religion must be pure, not pretentious. 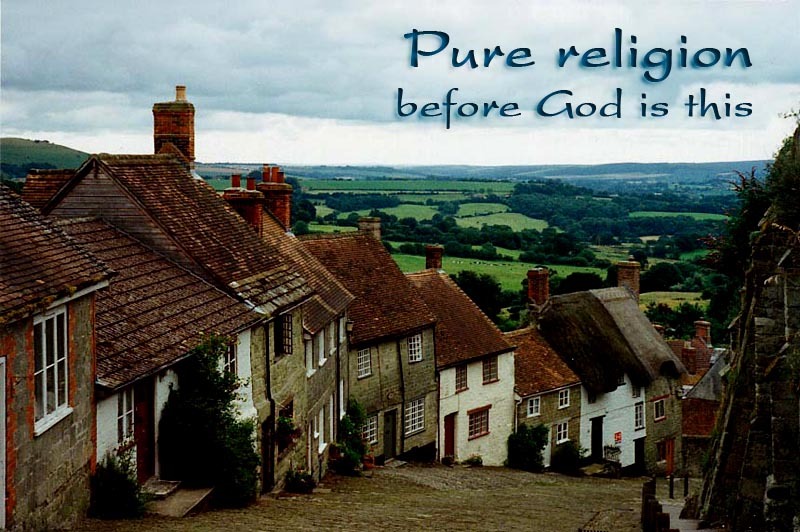 Pure religion must involve others as well as self-restraint. Pure religion means being kind toward those who need our kindness, such as those who have no father, or those whose husbands have died. Pure religion also means that we must be authentic, free from ulterior motives as well as be inwardly genuine. We cannot be actors who talk about God as part of some performance before an audience. We do not usually fear religious sin. Indeed, for many us there can be no religious sin, if our heart is right. Yet, in James we are specifically warned about confusing our role with that of God. What does James say about our anger, apparently in those cases in which we know we are right and God is on our side? In Numbers 20, Moses and Aaron were told to speak to the rock. Moses instead struck the rock, calling the people rebels, and he even went a step further. What did Moses actually say to the people (Number 20:10)? How did God evaluate what Moses had said and done (Numbers 20:12)? What did James and John want God to do because of inhospitality shown to the Christ and to them (Luke 9:51-56)? Could there be a sin of speaking too quickly in discussing the word of the Lord with others? What does James caution us? Why is reflecting on what God is saying to us more important than what God might be saying to others? If I have not self-control, will others want to believe me if I try to speak with them about Christ? How does God look at me and evaluate my attempts at a religious life? When was the last time I did something for someone else?